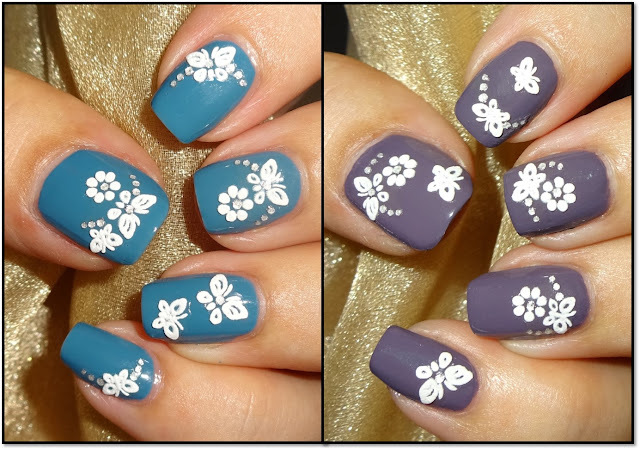 I've got a lovely pack of Flower & Butterfly Nail Stickers from Nail Art UK to show you. There are a total of 39 individual stickers. Beautiful white flower and butterfly nail art decals with clear rhinestones. They are slightly raised and have a spongy feel to them. The Flower & Butterfly Nail Stickers are on a clear plastic sheet which really helps to guide you where to place the sticker on your nails. All you have to do is peel off from the clear plastic sheet, apply to your nails and seal with top coat. Simple, fun & effective. Very easy to use and highly recommended. There are a total of 39 individual stickers. Beautiful white flower and butterfly nail art decals with most of them having at least one clear rhinestone. The Flower & Butterfly Nail Stickers currently cost £0.99, super value when you think you can easily create a full mani or numerous accent manis with these lovely stickers. Available at Nail Art UK who have an amazing range of nail art items, please feel free to use my code WENDY10 at checkout which gets you 10% off nail stickers, water decals and 3D nail decorations!